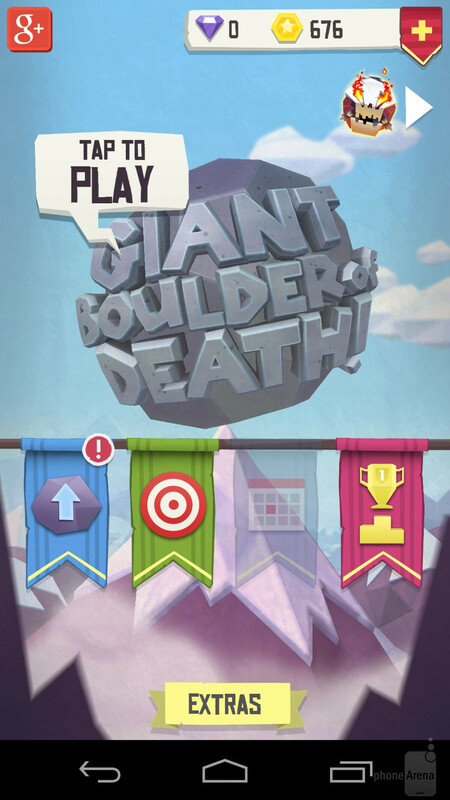 If you're not particularly stringent about the way you spend your free time, and love to indulge yourself into hilarious, albeit pointless experiences, then Giant Bould of Death is the mobile game you may just find out you love. Indeed, despite the massive variety of game genres available for mobile platforms -- from sophisticated strategies to arcades with polished 3D graphics -- one truth about gaming on such devices remains hard to argue against: most people are looking for nothing more than an occasional, casual spin, that doesn't necessarily chain them to the screen. Giant Bould of Death (GBOD) fits right into this paradigm for several reasons -- its exceedingly clever and downright wacky, and absolutely casuals-friendly. As the name suggests, in GBOD you take the role of a... well, a rolling, massive hunk of rock whose life goal is wrecking havoc and unleashing complete and utter destruction on a unsuspecting, never-ending valley that slopes for many miles. The gameplay and aim of the game are simple enough for even a four year-old to grasp: you need to obliterate as much as possible, whether it's stray peasants, their livestock, or even their homes. 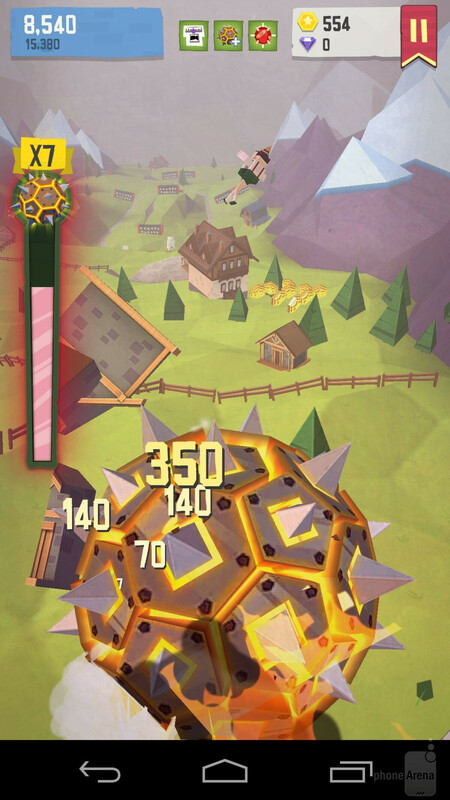 To control the boulder, simply tilt your phone left and right (you can change this in Settings), and press the screen whenever you want to jump over an obstacle. Indeed, you should stay alert, as the kingdom you're terrorizing is not at all without means of defense – soldiers will erect spiked walls in your path, and litter the land with mines that are out to get you. And be careful with bigger buildings – you're not enough of a boulder to come smashing through these. Not until you annihilate enough objects and generate enough 'power' (seen in the power bar on the left) to become an “Invinciboulder”, at least. An Invinciboulder, like any proper Invicinboulder, is an expert at shredding stuff to pieces. What's more, no structure, no matter how spike-y, will be able to withstand your awesome power. Believe it or not, in concert with the wacky soundtrack, this makes for a very relaxing, but hilarious experience. Given how GBOD is free, you should obviously expect ads and in-app purchases. 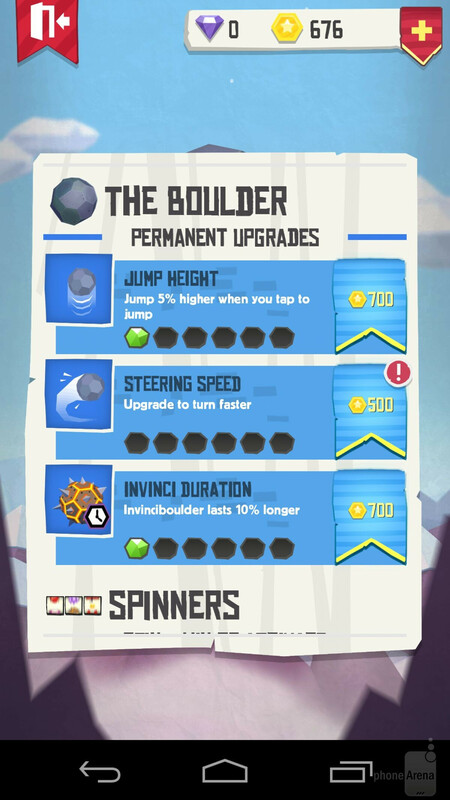 The latter will allow you to quickly upgrade you boulder into an even more impressive piece of rock, though you can obviously collect coins whilst smashing everything around them to bits, and modify your abilities that way. Moreover, if you ever get tired of smashing through the same realm over and over again, you can buy your way into another, with a different theme, at the cost of gems (rare) or just good old hard cash. These ought to keep you involved for at least a couple of weeks. We know they kept us glued to the screen, at least. Frustratingly addictive, one of the best games I've played.